Miami is one of my favorite places in Florida to visit with the kids. The weather is always hot and sunny and there’s never a shortage of things to do. Whether you’re a family that loves the outdoors and nature or you prefer to examine art, culture, and history, you’ll find what you’re looking for in Miami. While you as a parent will experience a different side of Miami than you would as a single adult, the city still has plenty to offer. I love that Miami has its own unique flavor and culture. It has a completely different vibe than the rest of Florida. Our family has driven down to Miami a few times now, and we try to experience something new each time were there. The city is enormous and very spread out, so there are lots of different neighborhoods to explore. You’ll seriously never get bored. Here are some of the top things we’ve done with the kids in Miami that I think you’ll love, too! 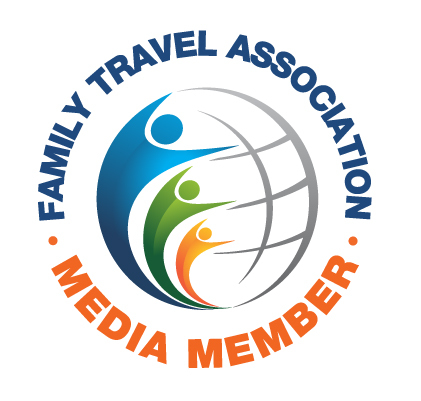 A few of our activities were paid for by Miami and Beaches in order to facilitate my article for TravelPulse, which you can find here. All opinions are my own. As soon as you pull into the parking lot and see the brightly colored building, you know the kids are in for a good time. We visited on a Saturday afternoon, and it was pretty busy, but there was still so much to do there that the kids were never waiting too long to look at an exhibit. The museum is incredibly educational, but the kids don’t see it that way. They think they’re just playing and interacting with some really interesting toys. One of our favorite spots was the sketch aquarium where kids could color a sea creature, scan it, and have it show up on the wall-sized screen, floating around with all the other drawings. It was so exciting for them to see their work on display like that! 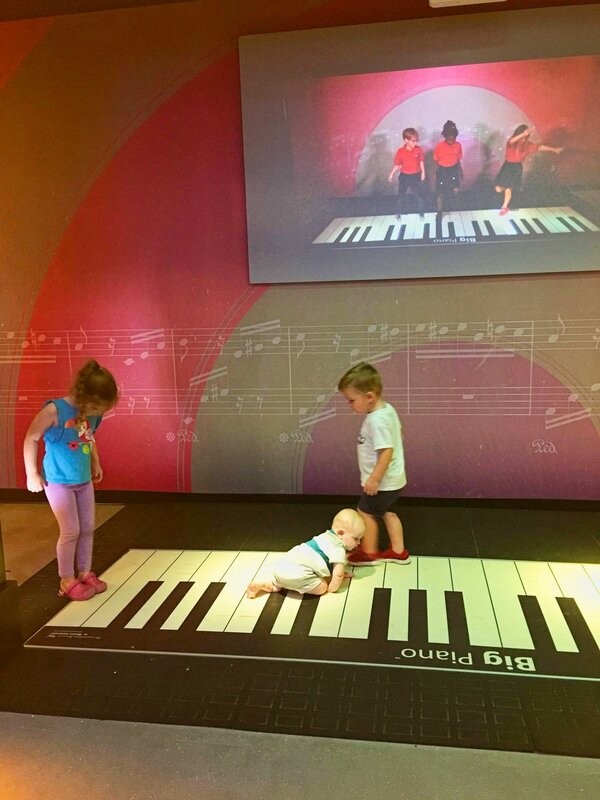 The Health and Wellness Center along with the Music Makers Studio were also big hits with my toddler and preschooler. 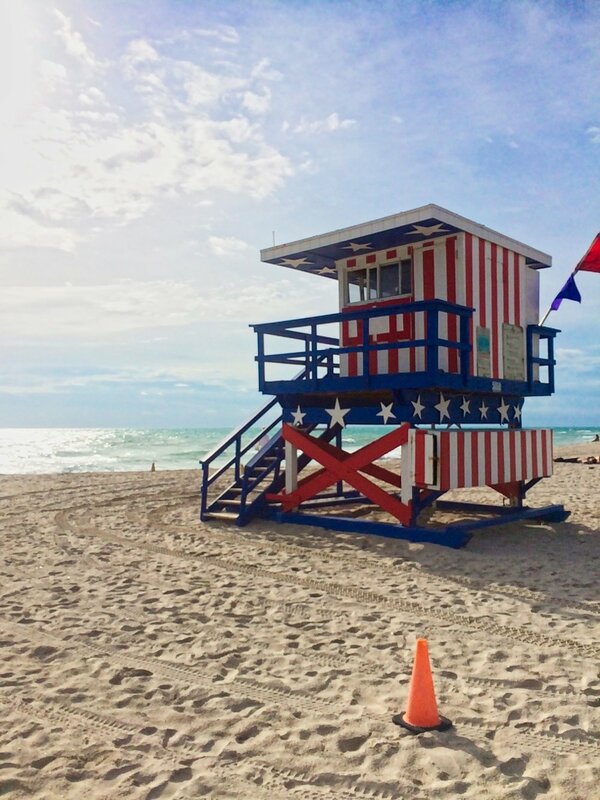 Naturally if you’re in Miami, you’ll probably want to spend some time on the beach. We had some local friends take us there for a morning in the sand with the kids and we had a great time. We had plenty of room to spread out with our baby gear in the golden sand, and the kids loved splashing in the waves. After enjoying some fun in the sun, we made our way over to Lincoln Road, a pedestrian thoroughfare with shops and restaurants. 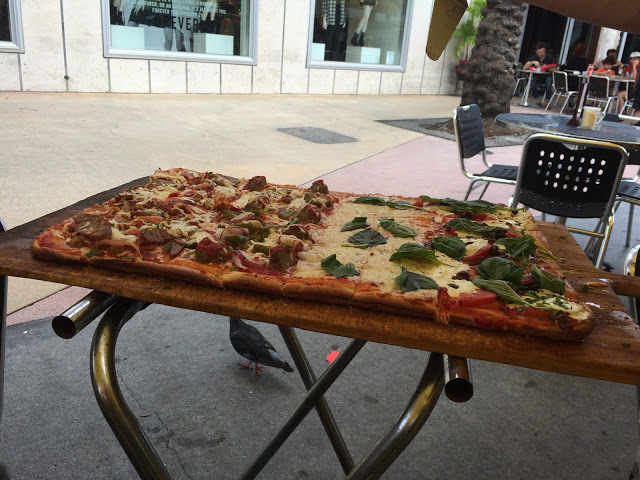 We ate at Pizza Rustica which was the perfect meal to share with a large group of adults and kids. If you’re into shopping and Art Deco architecture, make sure to take a stroll along Ocean Drive. 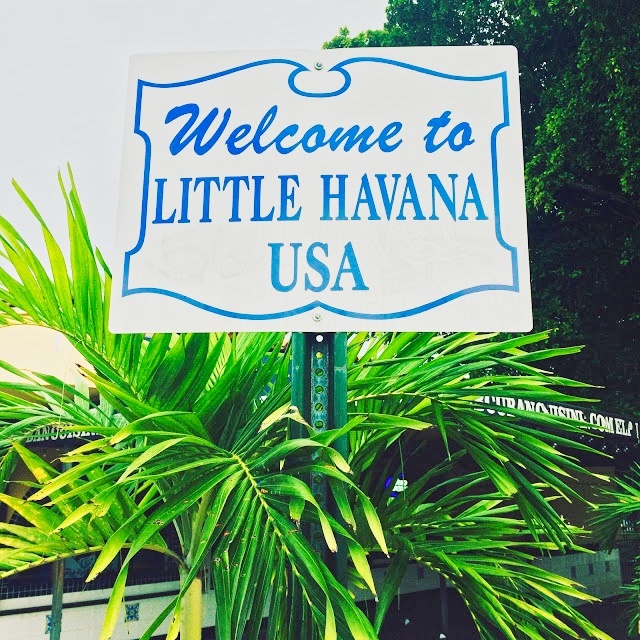 Visiting the Little Havana neighborhood is my favorite experience so far in Miami. 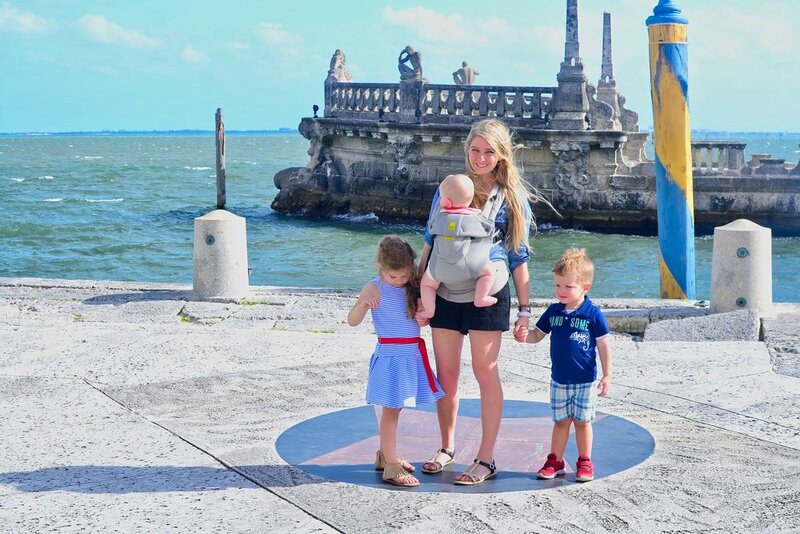 We were actually in Miami for a teacher’s conference, so while my husband attended that, I decided to get out and explore the city on my own with the kids. As a former Spanish teacher, this part of town called my name. We found some street parking off the main stretch, I loaded the kids in the stroller and we started exploring. Right away a wave of salsa music swept over us and had me dreaming of Cuba. Most of the action happens on the infamous Calle Ocho, made famous by numerous Pit Bull songs. Since I happen to be a fan of Pit Bull, I was excited to be walking along his home turf. First stop at Maximo Gomez (Domino) Park to watch the old men play dominos. It’s right on the corner of Calle Ocho and 15th Avenue. 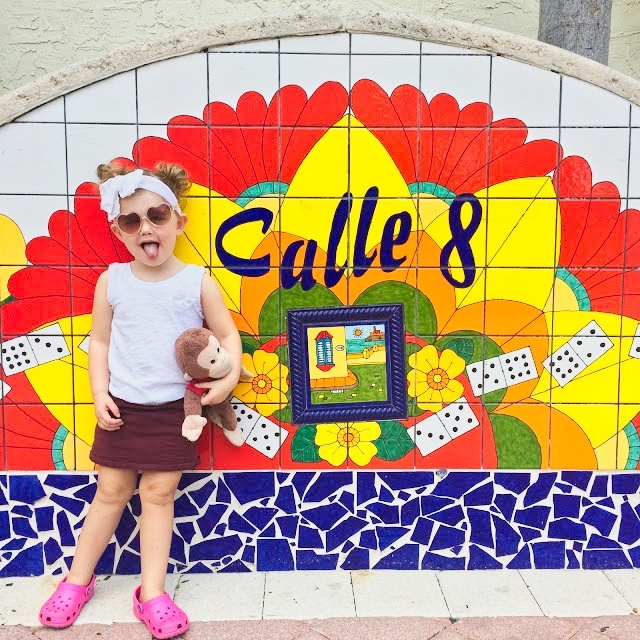 Make sure to get a picture near the colorful tiled wall that says “Calle 8” and head over to Azucar for some sweet Cuban ice cream. They have some really fun flavors, so be sure to branch out from your typical chocolate or vanilla. We never ate here, but I’ve heard wonderful things about Versailles Restaurant. Vizcaya is the former winter home of James Deering in the early 1900s, and it’s a masterpiece to behold. The mansion is now a vignette of what life was like for the super rich a century ago, and is filled to the brim with art, furniture, and decor original to the house. The museum is fine to do with kids, although my little ones didn’t last long indoors. You can bring a stroller, but it’s not particularly stroller-friendly. Outside in the gardens is where this destination really shines. The elaborate garden sits on 50 acres with beautiful walking paths, fountains, and various flora and fauna. Out back is a terrace overlooking Biscayne Bay, and it’s an absolutely beautiful spot. Just keep an eye on your kids because there’s no protective rails between you and the water. Picture a harbor filled with the yachts of the rich and famous, shops, restaurants, and souvenir stands. This is the perfect spot to come wander around with your kids to do some shopping and exploring. There are tons of boat tours around the harbor, so look into those if your kids love the water. Bayside is a low-key way to spend a morning or afternoon in Miami. Coral Castle is quite a unique destination just outside of Miami. It’s a stone sculpture garden built single-handedly by Ed Leedskalnin in the 1940s. Ed was quite small, so the fact that he figured out how to create chairs, tables, sundials, walls, and more is quite the accomplishment. The tour is fascinating, but unfortunately my 3 little ones got bored after about the first 20 minutes. I wanted to stay and listen, but to respect the rest of our tour group we bowed out a little early. I highly recommend checking this out if your kids are elementary school age or older. The story behind Coral Castle and the meaning behind each sculpture will capture your imagination. If you want to drive over a bridge and feel like you’ve arrived at a tropical island, then definitely take your kids to Key Biscayne. Bill Baggs State Park is a great spot to start with plenty of beach access, playgrounds, hiking trails, and biking trails. Climb the lighthouse in Bill Baggs, then grab a bite to eat afterward at the Lighthouse Cafe. Form the beaches you’ll be able to see the skyline of Miami, and it’s such a stunning and tranquil getaway from the buzz of the city. Coconut Grove is a family-friendly neighborhood right down the road from Vizcaya with bookstores, parks, ice cream shops, and plenty of boutiques for shopping. Park your car and wander around for an afternoon just soaking in the views, the laid-back vibe of the community, and letting kids be kids. We got ice cream at Bianco Gelato and loved it! Visit the Miami and Beaches website for more activities and ideas! Make sure to try Cuban coffee. I’m usually the type who likes a little coffee with my creamer, but I didn’t need to add a thing to make Cuban coffee from a gas station palatable. It’s sweet, strong, and frothy. You’re welcome. Stay in the city. If you’re commuting you’ll face tremendous traffic and tolls everywhere you go. Or maybe just avoid driving altogether and use Ubers and public transportation. Get the Go Miami card. If you’re planning to fit a lot of attractions in, this card will save you some money. Yes, Miami is expensive, crowded, and a bit crazy, but in my opinion you can’t beat the Miami sunshine and flavor. It’s a unique city that has a reputation for wild nightlife, but in reality has so much art, culture, nature, and cuisine that you could explore for weeks and still not see everything worth seeing. Bienvenido a Miami. You’ll love it!